Can Handbrake convert M4V to MP4? I have some M4V files and want to play them on my Android devices, so I need to convert .m4v to .mp4. I converted to MP4 but Handbrake keeps going to .m4v file extension and refuses to take .mp4. How can I convert .m4v to .mp4 with Handbrake? M4V vs MP4, they are the same formats according to Handbrake. Even if you choose MP4 as output, Handbrake still gives files with .m4v extension. instead of .MP4. Since M4V and MP4 are interchangeable, some suggest auto copy M4V video to MP4 without re-encoding, which is not a good idea as it's possible that the renamed MP4 file is unplayable. Handbrake, the most popular free video converter for Mac/Win, does convert M4V to MP4. Here's how to do it. MacX Video Converter Pro, a solid Handbrake alternative, lets you convert iTunes M4V purchases to MP4 flexibly without "No valid source or titles found" error. 5X faster than Handbrake. More output formats options, 350+ preset profiles for Android, iPhone iPad etc., no quality loss. Before you start, you need to change the preference settings in Handbrake. Use steps below to convert video to .mp4 extension instead of .m4v. Also try these steps if Handbrake rips DVD to M4V not MP4. Step 1: Open Handbrake, click Tools tab in the top-left corner, click Preferences under Tools menu. 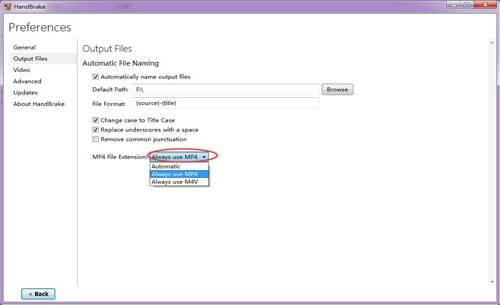 Step 2: Click Output Files and on the bottom, open the File Extension drop-down menu, select "Always use MP4". Step 3: Click Back and follow the guide below to learn how to use Handbrake to convert M4V to MP4. Handbrake should use .mp4 extension now. Step 1: On the main interface of Handbrake, click Open Source > File (Open a single video file) and select the M4V file you'd like to change to MP4. Step 2: Click Browse to select a Destination folder to save converted the MP4 file. Step 3: On the Output Settings area, choose MP4 as output container format. Step 4: Adjust video audio settings in Handbrake. Learn the best Handbrake settings. Or just keep the default settings. Step 5: Click Start Encode to begin to use Handbrake to transcode M4V videos to MP4 on Mac/Win. As the best video converter for Mac/Win, Handbrake can also convert MOV, convert MKV to MP4, etc. However, it only supports to output MP4 and MKV container formats. Things Are Different If You Convert iTunes DRM Protected M4V Videos to MP4 using Handbrake! Will Handbrake convert iTunes M4V with DRM protection to MP4? If the source M4V file is DRM-free, Handbrake does that perfectly. However, if the M4V file comes with DRM protection, Handbrake won't make it done, with an error message telling "No valid source or titles found." Handbrake can't remove DRM from iTunes M4V movies. "The source may be copy protected or include DRM. Please note that Handbrake does not support the removal of copy protections." To convert M4V encrypted files to MP4 with Handbrake, you have to use DRM removal software, MacX Mediatrans, the most efficient tool we've found so far to remove DRM from iTunes on Mac/PC. The program can directly convert iTunes DRM M4V to MP4 on Mac/Windows, making it a good Handbrake alternative in terms of iTunes DRM M4V to MP4 conversion. For much faster speed, better quality, and more output format options, try the Hanbrake alternative, MacX Video Converter Pro, to convert iTunes M4V purchases to MP4 without "no valid source or titles found" error. Step 1: Free download the Handbrake alternative for macOS or for Windows, and launch the program. Click Add Video icon and select source M4V files to load from the popping up window. 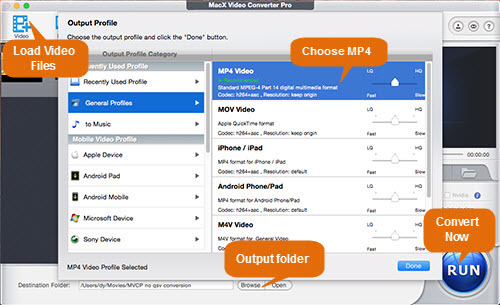 Step 2: On the Output Profile window, click General Profiles, select MP4 Video, click Done. Step 3: Click Browse button to select a destination folder to save converted files. Step 4: Click RUN to start to convert M4V to MP4 with Handbrake alternative on Mac or Windows. It's the quite the same to convert M4V to MOV, M4V to AVI, MKV to MP4, MOV to WMV, to name a few. Free download the best Handbrake alternative, M4V DRM removal, to convert iTunes M4V to MP4 with 5X faster speed than Handbrake, as well as convert MOV to AVI, MKV to MP4, AVCHD to MP4, FLV to Android, YouTube to MP4/MP3, etc.